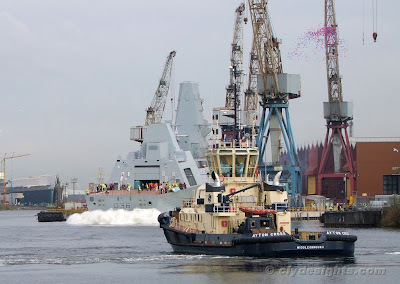 At 1514, DEFENDER was named by Lady Massey, wife of Vice Admiral Sir Alan Massey KCB CBE ADC, in front of the many people in the shipyard and on the north bank of the river. 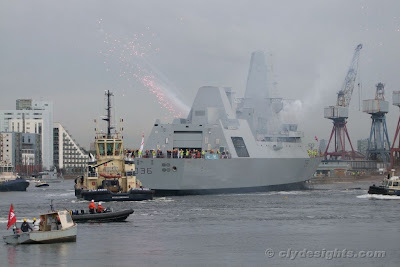 Moments later, the ship slid smoothly into the Clyde. 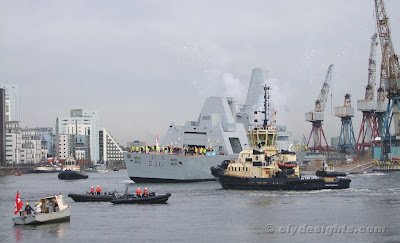 Once the dragchains had brought DEFENDER to a halt, the tugs moved in to take charge. Apart from AYTON CROSS, CMS BUSTER and BITER were present, as were Clyde Marine's line runners, COURIER and TERRIER. In the foreground is BATUG 12, a small workboat belonging to the shipyard. As is customary nowadays at such events, fireworks were set off from the ship as she was launched, together with a number of balloons. 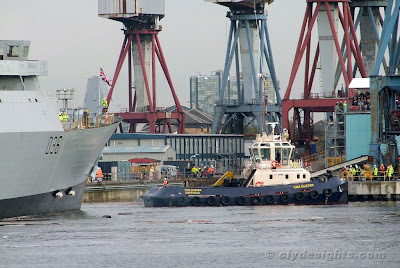 With AYTON CROSS made fast aft, CMS BUSTER took charge at the forward end and gently eased DEFENDER into the shipyard basin, where she would be berthed until moving downstream to Scotstoun for further fitting out.